Volvo’s flagship S80 sedan focuses on luxury via a simplified model lineup. 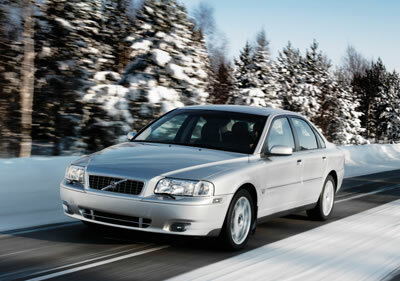 The range now comprises the S80 2.5T and the S80 2.5T AWD. Meanwhile, the list of standard equipment for the 2.5T and 2.5T AWD has been greatly enhanced. Thus, the S80 2.5T and 2.5T AWD are fitted with standard leather seating surfaces, power glass moonroof, real wood inlays, a wood-trimmed steering wheel and power passenger’s seat. Also included are standard T6 style front and rear sport seats, 17-inch “Senator” alloy wheels and the more upscale “watch dial” instrumentation. New All-Wheel Drive with Instant Traction™ is standard on the S80 2.5T AWD. It mates with the S80’s 2.5-liter turbocharged engine for positive, instantaneous torque and optimum launch performance. The improved, computer controlled Haldex all-wheel-drive system instantly delivers up to 50 percent more torque to the rear axle only when needed, such as during takeoff.